We got this idea from Wholesome Cook, whose curried egg and prawn cocktails grabbed our attention a few months back. Of course we didn’t have curry, or brown eggs and we don’t even use the word prawn 75 percent of the time when discussing shrimp. But still we were inspired and we had left over pesto. Toss shrimp with oil and spice. Steam until the shrimp start to curl about three minutes. Remove from heat, but leave lid on. Allow to cool. In the meantime. Cut the top quarter of the egg off each egg and scoop out the yolks into a bowl with yogurt and pesto. Reserve the tops. Mash together the yolks, pesto and yogurt to combine. Spoon egg mixture back into the eggs and wedge in a prawn. Place in a little espresso cup. Top with egg white. This blog attempts to collect some of the things I try to create with food and booze. Sometimes I succeed and sometimes I fail. My hope is to entertain and maybe help people think a little harder about what they decide to eat and drink. This entry was posted in Appetizers, Food, Seafood, Sides and tagged eggs, entertaining. Bookmark the permalink. What a clever dish! I would never have thought to add pesto to egg, to begin with, but to then pair it with shrimp? I’m sure Sam would approve. I can never stop at a dozen! Haha! I wish I had come up with that…. Thanks for being inspired! Fantastic idea, and they look so very, very pretty in your gorgeous cups! LOL I saw the word prawn and thought.. pretty highfalutin’ for a yank. 🙂 It took me a while to say prawn – shrimp just rolls off the tongue. I’ve also never seen them tossed on a barbie here. I met Martyna at a food styling workshop in Sydney last year. She’s incredibly clever and I love her food and her photos. pretty unusual and creative recipe, love the pesto addition! Only recently I got to know Wholesome Cook, nice site! They sounds great though I love the idea of curried egg and prawn cocktail too! I don’t care for eggs . . . but that presentation is GORGEOUS! This flavor/ingredient combo could not get any more perfect. Pesto, eggs, shrimp…who woulda thunk?! Great appetizer, and love the presentation. A perfect accompaniment to the UK Jubilee tea time festivities. I’m sure this is delicious, but it reminds me of the dinner seance scene in Beetlejuice. These look fantastic – what a great idea! WOW. That’s all I can say about this recipe. Well, that and: AMAZING. 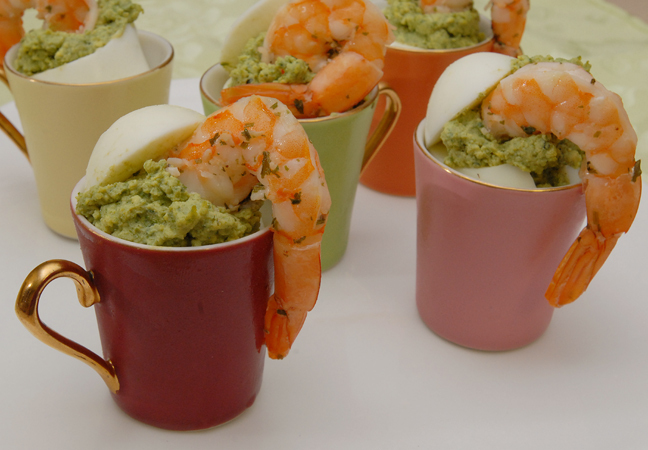 Eggs and pesto and shrimp served in little mugs?! Great, great stuff. Okay, so I could say more than just wow. Pesto mixed into the egg yolks sounds fabulous! Sounds wonderful Greg – loving the idea of pesto and egg together, and those shrimp nestling in the top… yummy! Deviled eggs are a favorite of so many people and you have made the fancy. Nice. These absolutely rock! I’m definitely making these as an app the next time we have people over. Very clever!!! I’ve been enjoying your site so I’m nominating you for the Illuminating Blogger Award for informative, illuminating blog content. I know not everyone participates in blog awards but I hope you’ll at least check it out because it’s a great way to discover new blogs and meet new web friends. If you’re interested in participating, you can check out the details at my site … http://foodstoriesblog.com/illuminating-blogger-award/ … Either way, hope you’re having a great day! Thanks, a bit behind on our reading!